The young midfielder poked in his second goal from close range after eight minutes before curling in a 20-metre (yard) shot in the second half as Loftus-Cheek became the first England player to claim a European hat trick for Chelsea since Peter Osgood, the ‘King of Stamford Bridge’, in 1971. However, coach Maurizio Sarri said he was unsure if Loftus-Cheek would remain in the team for Sunday’s Premier League game at Burnley. Led up front by Gonzalo Higuain, seven-time European champion Milan looked hungry in the opening stages. But Betis was also dangerous in attack and Toni Sanabria’s close-range effort put the Spanish team 1-0 up after half an hour. Milan’s Samuel Castillejo, who hit the post earlier, was sent off for a rough tackle in injury time. Betis tops Group F with seven points, one ahead of Milan. Olympiacos follows on four after a 2-0 victory at Dudelange. 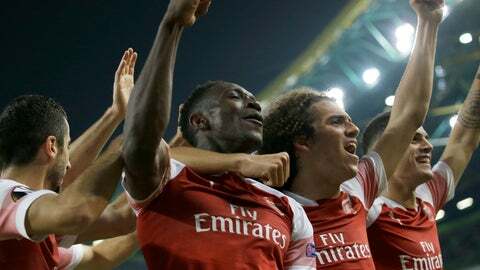 Coach Unai Emery made six changes to his starting line-up against Sporting but the story remained the same as Arsenal triumphed 1-0 to extend its winning streak in all competitions to 11. Arsenal has nine points in Group E, three ahead of Sporting. Vorskla Poltava won 1-0 at Qarabag to move up to third with three points. Salzburg controls Group B on nine points after a 3-0 victory at home to Rosenborg. Munas Dabbur scored twice, once from the penalty spot, and Hannes Wolf also netted. Leipzig is second on six points after a 2-0 win over Celtic (3). Rosenborg has zero points. Filip Kostic and Sebastien Haller led Eintracht to a 2-0 win over Apollon and top spot in Group H on nine points. Last year’s finalist Marseille lost 3-1 to Lazio and is now tied at the bottom with Apollon on one point. Lazio has six points.